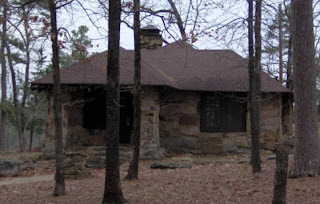 Petit Jean State Park is a beautiful park in north central Arkansas. It has large pine trees, water falls, scenic bluffs, caves and some wonderful hiking trails. There are many campsites here, but they also have cabins to rent and even a lodge and restaurant here.